Fragment from a Red-Figure Volute Krater (Mixing Vessel) with the Judgment of Paris. Attributed to the Darius Painter, South Italian, Apulian, ca. 380-370 BC. Ceramic. Tampa Museum of Art, Joseph Veach Noble Collection, 1986.105. The Classical World showcases nearly 200 Greek, Etruscan, and Roman artworks and artifacts from the Museum’s notable antiquities collection, supplemented with important loans from local private collectors. Ranging from prehistoric pottery and sculpture (dating from as early as 3000 BC) to marble sculpture and terracotta from the Roman Empire (dating to as late as the 5th century AD), the exhibition includes a particularly fine assortment of Greek and South Italian black-figure and red-figure vases. Also included in the exhibition are important works of sculpture in terracotta, stone, and precious metal, as well as ancient coins, jewelry, and glass vessels. Ongoing, reinstalled July 14, 2018. The Classical World in Focus: Contests, Combat, and Commemoration is currently on display. Contest, combat and commemoration played important and often interrelated roles in ancient art, life, and culture. This small exhibition, drawn primarily from the Museum’s permanent collection, explores a number of these connections within both mythological and historical contexts. Altogether, some eighty works of Greek, Roman, Etruscan, and Egyptian art are included, ranging from the sixth century BC to the fourth century AD, and from painted pottery to sculpture in terracotta, bronze, and stone. This exhibition places in dialogue, for the first time, the work of two of the 20th century’s most innovative artists exploring light and space. Since the 1960s, Soto and Bell have pushed the boundaries of traditional painting and sculpture with new materials and forms. While there have been several exhibitions devoted to each artist, Bell and Soto aims to present their works in a fresh context not yet explored by curators and art historians. Bell and Soto is not a survey or historical overview of the artists’ prolific careers. Rather, the show will juxtapose key bodies of work by both artists in three sections: Cubes and Structures; Vapor and Vibration; and Light and Transparency. Cubes and Structures section will explore the reductive significance of the cube and the grid as both artists pushed beyond traditional painting formats and pedestal sculpture. Vapor and Vibration looks at how Soto and Bell have used color, as well as contrasting properties of light and dark, to render spatial illusion and optical effects in 2D planes. The final section, Light and Transparency, demonstrates the artists’ investigations of light, color, and surface in experiential-based sculpture and installation. Approximately 30-40 objects will be on view in Bell and Soto and will feature influential works from the 1960s through the present. This is the inaugural exhibition in a biennial series exploring synergy between collections that may initially strike visitors as wholly separate from one another – namely, classical antiquities and modern and contemporary art. Patricia Cronin (American, b. 1963) is an internationally recognized Brooklyn-based artist uniquely positioned for such a visual conversation. Winner of a Rome Prize in Visual Art in 2006-2007, and past Trustee of the American Academy in Rome, Cronin is deeply interested in the ancient world, which she frequently references in her work. For the first commission in our biennial series, Cronin has created a large outdoor sculpture of Aphrodite inspired by a fragmentary 1st-century AD marble torso of Aphrodite in the Museum’s collection. Entitled Aphrodite Reimagined, Cronin’s sculpture re-envisions the Museum’s Aphrodite fragment as a monumental “complete” sculpture with a stone torso and translucent head, arms, and legs. The sculpture invites viewers to reconsider the narrative of an ancient work heavily restored after its rediscovery, and acts as a metaphor for shifting certainties about human history. Cronin and Museum curators will also pair an Etruscan cinerary urn from the Museum’s collection with multiple iterations of Cronin’s 2002 sculpture Memorial to a Marriage, a powerful artwork that references ancient and neoclassical funerary monuments as well as contemporary issues of social justice. The final gallery of the exhibition will comprise a visual dialogue between figural works by Cronin and several antiquities from the Museum’s permanent collection. This exhibition is made possible by the Vinik Family Foundation. The Tampa Museum of Art is pleased to present Yayoi Kusama’s LOVE IS CALLING, one of the artist’s iconic Infinity Rooms, on loan from the Vinik Family Foundation Collection. An immersive, experiential work of art, LOVE IS CALLING invites visitors to enter a mirrored room with tentacle-like soft sculptures hanging from the ceiling and positioned on the floor. These forms glow with changing colors and feature Kusama’s signature polka dots. Mirrored walls create a kaleidoscopic effect, with the reflected imagery of the tentacles seemingly extending into infinite space. Visitors hear audio of the artist reciting a love poem in Japanese as they walk throughout the installation. This exhibition is organized by the Albright-Knox Art Gallery, Buffalo, NY. On the occasion of the American artist Robert Indiana’s ninetieth birthday and in recognition of his broad and enduring achievement in sculptural media, the Albright-Knox Art Gallery will mount Robert Indiana: A Sculpture Retrospective in Summer 2018. The exhibition will then travel to Tampa, the only other venue. Having gained international prominence in the early 1960s, Indiana (born Robert Clark in 1928) has created some of the world’s most immediately recognizable works of art. Filled with intensely personal combinations of universal symbols—words and numbers, stars and wheels—his sculptures, paintings, drawings, and prints are most readily associated with the Pop art movement. Indiana’s work in sculpture offers a unique opportunity to consider the multiple paradoxes inherent in his practice of creating objects of significance and permanence from everyday impressions and materials. Many of Indiana’s sculpture have never been publicly exhibited in the United States, and some of the most extraordinary examples of his career-defining LOVE sculpture, one of the twentieth century’s most iconic works of art, have never been shown anywhere. This exhibition offers a thorough reassessment of the artist’s work in sculpture, from his earliest assemblages of the late 1950s to his most recent series of remarkable painted bronzes. Our educational tour series, titled “Art and…”, offers different tour themes, each designed to align with a specific course curriculum. Students are encouraged to use critical thinking and viewing skills to connect with the art on view with the students’ classroom curriculum and to discover how it relates to their studies and life experiences. If you have a specific Florida Standard you would like to achieve during your visit, we are happy to work with you. Our greatest strengths are in Visual Arts, Language Arts and Social Studies (Ancient Civilizations). Art and Looking: Look close and discover the meaning, media, and inspiration behind the artwork. Focus on modern and contemporary art and/or ancient art to have meaningful conversations about the artwork on view. Art and Storytelling: Discover the stories behind the objects. Practice your story telling skills by examining visual representations of well-known myths and real world events and using the artwork to inspire new stories. Art and the Ancient World: Focus on the iconography and objects of the ancient Greeks and Romans as you explore The Classical World. Learn about Greek and Roman artifacts within their artistic, social, religious, economic, and political contexts. 45-60 Minutes in length and can begin as early as 10am. The maximum number of students in the galleries at one time is 60. Groups interested in seeing only one exhibition are capped at 30 students. Large groups are divided into smaller groups of 10-15 and led through the galleries. Groups larger than 60 can be accommodated by staggering lunch times in the adjacent Curtis Hixon Park. Bus parking is conveniently located directly across from the Museum on Gasparilla Plaza. Activity and study guides can be made available upon request for our antiquities collection. Tours are free for K-12 students and school groups receive one free adult for every 10 students. All additional chaperones and teachers are $15 for adults and $7.50 for FL educators. The bus is on us! 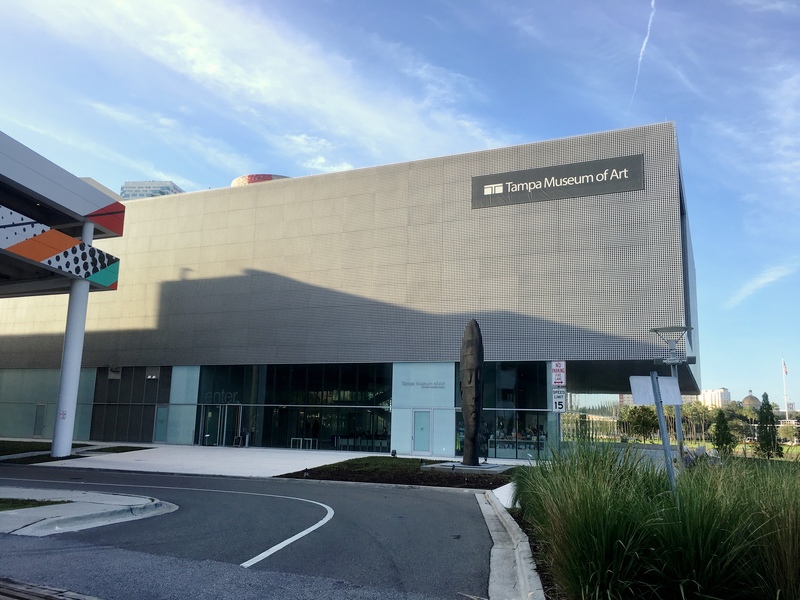 Book a tour to the Tampa Museum of Art and through our Art Line Bus Grant program, we will cover the cost of your transportation. Art Line is made possible by the Corbett Family Foundation, the Tampa Yankees Foundation, and Suncoast Credit Union. Tours must be scheduled a minimum of two weeks in advance, on a first come, first served basis. A School Tour Request form is available on the website at www.tampamuseum.org/School-Tour-Request.